Presented by SVBC as a Christmas gift to the community. A behind-the-scenes look at some of the things seldom seen by those in the auditorium. 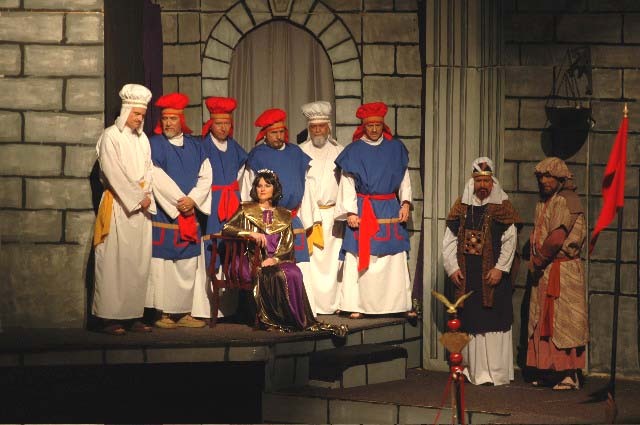 These pages are not authorized by, nor sponsored by Severns Valley Baptist Church or its paid staff, but are an independent undertaking for the enjoyment of those interested in the LCT and what happens behind the scenes to create the production. The 23rd - and FINAL - season (for SVBC). The 2005 PROGRAM SCHEDULE was:. Wednesday, December 7, ~7:30 p.m. (For the troops from Ft. Knox - a few seats available to the general public). Thursday, December 8, 7:30 p.m. - First performance for the general public. Saturday, December 10, 5:00 and 8:00 p.m.
Sunday, December 11, 5:00 and 8:00 p.m. The Living Christmas Tree ministry continues! 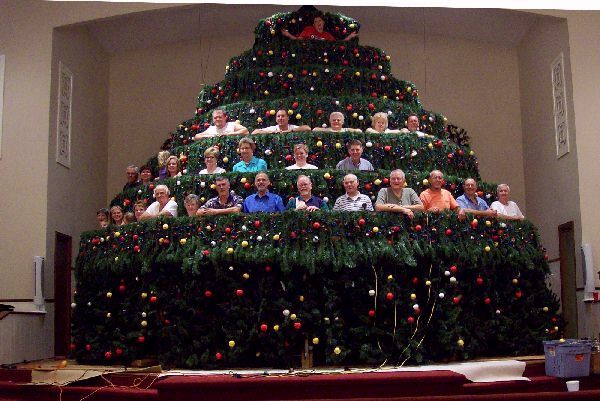 While SVBC will no longer be doing the Living Christmas Tree, its ministry continues! 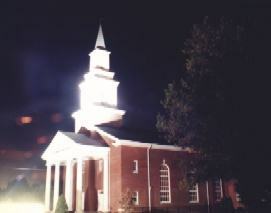 Clear Springs Baptist Church, 3709 Clear Springs Road, Mascot, TN 37806 (NE of Knoxville, TN) has purchased the LCT and will be presenting a program without any break in the ministry! If you are in that area, contact Clear Springs B C (423-933-3841) http://www.clearspringsbaptistchurch.org/ for their schedule and more information! Clear Springs BC workers setting up the LCT for the first time. 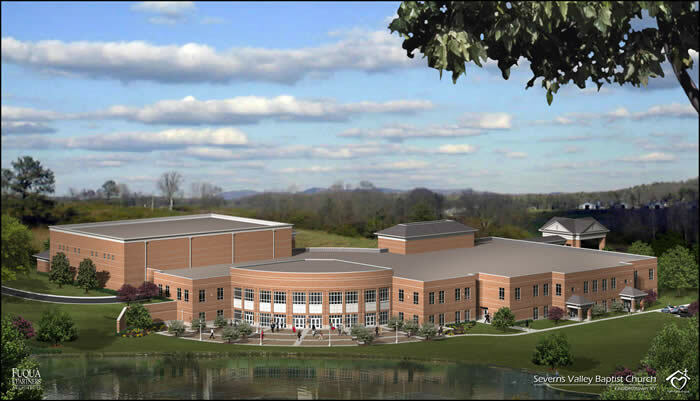 New SVBC campus plans Back at Severns Valley Baptist Church, there are some special things planned. 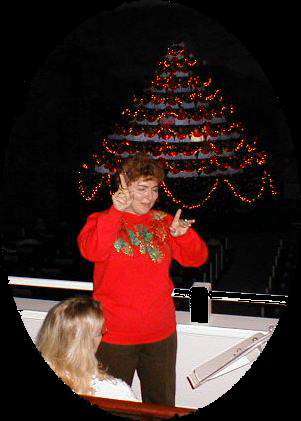 For 2006, the LCT choir is recording a music CD with ten selections from the Living Christmas Tree performances. This CD will be made available to the public on December 10. Contact the church for more information. (Descriptions, more photos, other whole pages, below). CLICK on individual photos for LARGER VERSIONS, or in some cases for whole additional pages of photos and descriptions. Many of the photo files are large, and this is primarily a picture page. So it may be slow to download, depending upon the congestion on the Internet and the speed of your connection. Click on pictures to enlarge. Jessi flying over tree (and over her mother) during rehearsal. 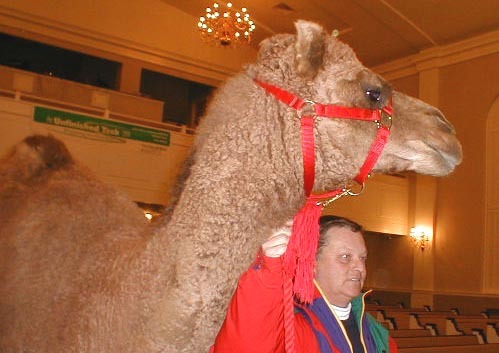 Photo by Mike Byers, with flash Camel walk-through during rehearsal. Photo by Mike Byers Power controller for lights on the tree itself. (More below, and on Technical page). The Living Christmas Tree has been presented by Severns Valley Baptist Church of Elizabethtown, KY, for these 23 years as a Christmas gift to the community. While it is intended to be entertaining and to help set the mood for the holiday season, these are not the primary reasons for doing this production. The LCT is dedicated as a gift to God, to tell the story of the coming of God's Son Jesus, the Messiah, who was born as one of us, lived a perfect life here on earth, and died for our sins. But he did not stay dead! He arose and lives today, to give us forgiveness from our sins and eternal life if we will only accept it! The LCT attempts to present this story in music and drama. 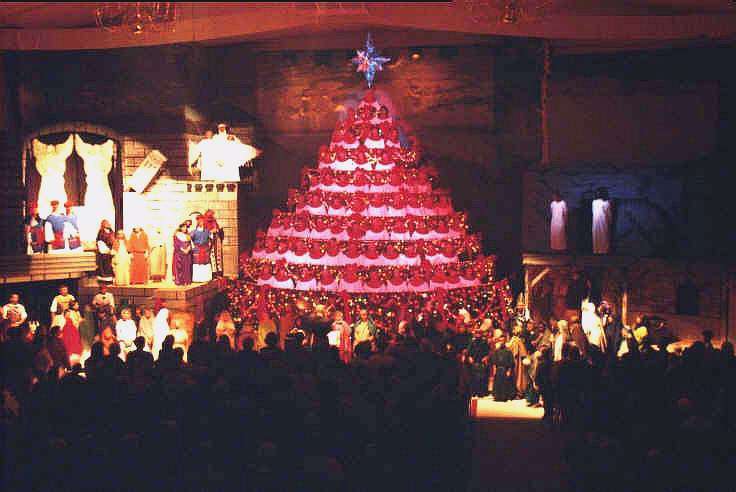 For the first ten years of the Living Christmas Tree, the program consisted of only the Sanctuary Choir singing from the tree. Since then, a drama telling about the life of Jesus has been included. The program touches on the entire life of Christ. It's a Christmas program, so the first 80 minutes are about his birth (including some prophecies and the political situation in Israel). This is followed by about eight minutes of his ministry and 20 minutes of his death, resurrection, and ascension. The entire program runs approximately one hour and 50 minutes, includes some 16 songs (the number may vary slightly year to year, and approximately one-third of the music each year is new), and seventeen drama scenes. In addition, a light show using the hundreds of computer-controlled lights on the tree adds additional color during certain songs (click on the technical page picture below for more on the lighting). The auditorium seats about 800 people and is usually completely full each evening; ten performances each year means that only about 8000 people are able to attend. (A brief survey is taken at the beginning of each performance. Each time, over 50% of those attending are seeing it for the first time! It is hard to believe that, after 20+ years, there are still this many first-time visitors). The music and drama require nearly two hours, with no intermissions. It is not recommended for children younger than about 5 years of age due to its length and also because of the intensity of some of the scenes and sound effects. (Child care facilities are provided). If you have tickets, plan to arrive 30 minutes before the performance. (See below for ticket information). TICKETS TICKETS to the LCT are free, and available on a first-come first-served basis. Tickets are normally available to the public just before Thanksgiving. All tickets are usually gone within two days! This year, tickets will be available on Monday, November 14, beginning at 9:00 a.m.
Severns Valley Baptist Church, P.O. Box 130, Elizabethtown, KY 42702 - Attn: Marsha. Please give a first and second choice of programs and a daytime phone number or email address. Tickets will be mailed the week of November 30. If you're interested in attending, it is suggested that you phone the church Music Department at (270)765-7822 BY THE FIRST OF NOVEMBER for current information and for possibly reserving tickets. See the SVBC Web site for more. TOO LATE - NO TICKETS available? You can try to get a seat by being at the door 20 minutes before the start of a service. Ticket holders are advised to be in their seats 30 minutes before the beginning of the next service. If there are empty seats remaining 15 minutes before the start time, they will made available to anyone, whether or not they have a ticket. Note that there is no guarantee of a seat. But if you live in the area and want to see it, you should have a chance. (Dress is informal). Severns Valley Baptist Church is currently located at the corner of West Poplar Street and Morningside Drive, and is one block north of West Dixie Ave (US 31W). 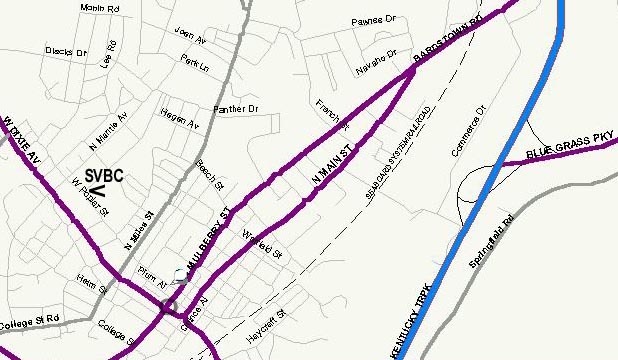 Click here for a partial map of Elizabethtown. (See the SVBC pages for last-minute changes or updates). These pages do not attempt to cover much about the Living Christmas Tree! It is FAR too big for a few pages on the Web! The performance runs about 105 minutes of continuous action with no intermissions, involving all parts of the auditorium, with 60 or more choir members, a light show, live animals, plaster-cracking thunderclaps, falling columns, and flying angels. These combine to make the story of Christmas come alive, as it progresses from the despair of the Jewish people under Roman occupation and their hope for a Messiah, through Jesus' birth, crucifixion, resurrection, ascension, and promise to return. During the Christmas season, Severns Valley's Web site may have other photographs. Go to the SVBC Web site and follow any links to see if they have more pages of pictures and up-to-date information. 14 seconds of final measures of "Canticle of Joy." Can be downloaded and played. NOTE - WAVE file version is 613 K - download time may be very long (4 min - or more). 10 seconds of "Lift Up Your Voice." Can be downloaded and played. NOTE - WAVE file version is 437 K - download time may be very long (3.5 min or more). It takes a long time to download long WAVE files of music, long full-motion movie files, or even to download a lot of large photographs. Thus, this first Living Christmas Tree page will be mostly small photos and some background text. You can enlarge most of the photographs on all of the pages by clicking on them. Several of them will take you to additional, separate pages, where you can look at other pictures on a particular subject. This will keep the download time to a minimum and allow you to explore things that catch your interest. Also, two very short WAVE files of music are included that can be downloaded. Note, however, that even though the audio is of only medium quality (a sample rate of 22,050), the files are long and may require too much time to download - typically 4-5 minutes, more if the Web is congested. MP3 versions are also available, which should download much faster. Flash photography is not allowed during the performances, for obvious reasons. Therefore, many of the "performance" photos were taken by Mike Byers during dress rehearsals. (This is why some of the Jewish men don't have beards in certain photos - it's only a rehearsal!) Some available light photos were also taken during actual performances by Mike and Dr. Doug Ball, and a few others were taken from inside the Tree itself during performances (by a particularly sneaky photographer). Others were taken during the annual construction, wiring, rehearsals, etc. For these reasons, they are not necessarily what would be seen by someone seated in the auditorium, but are rather a behind-the-scenes look. 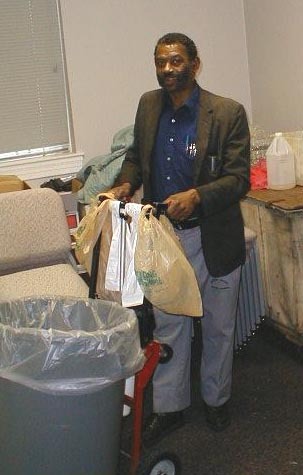 These photographs are from various years, from 1993 to the present. 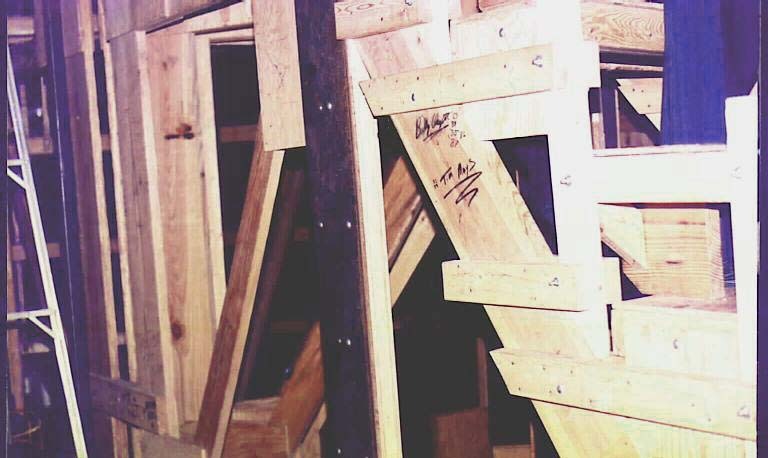 Back of tree's framework. Click for enlargement (47K). 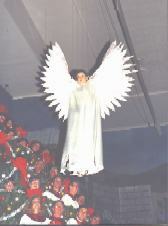 The presentation of the Living Christmas Tree began in 1983 with only three performances. This soon grew to five, then six. After the first ten years, drama was added to the music of the tree. 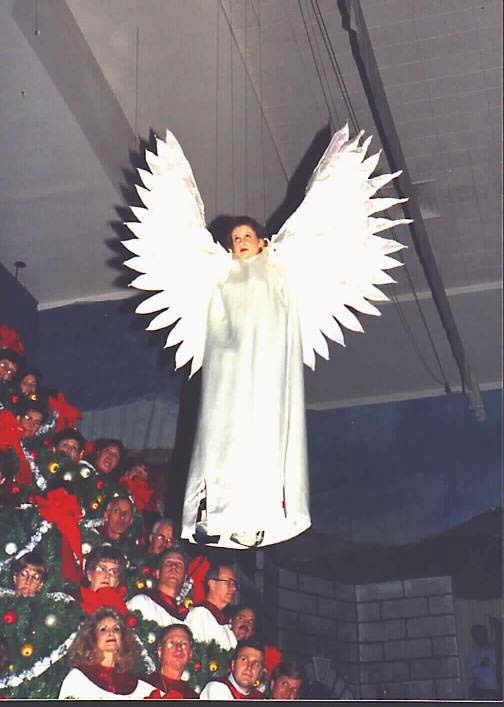 Beginning in 1997, Severns Valley Baptist Church began presenting five programs on two consecutive weekends in the middle of December for a total of ten presentations each year. (It has now gone back to a single week of seven performances). The framework for the tree, weighing nearly 10,000 pounds, is erected on the last Sunday evening in November. It takes a crew of about 20 men only 2 hours to carry in the individual pieces (some of which are very heavy) and bolt together the basic frame. Another 2 or 3 hours are required to install the risers, steps, railings, etc. (As the songs, drama, sets, lighting, other technical equipment, etc. change each year, the details presented here may vary slightly). Monday and Tuesday are spent hanging the tree's cloth background, chicken wire, greenery, many strings of lights, colored balls, and other decorations. The tree stands 35 feet high, and the many levels of the drama sets also reach nearly to the 40-foot ceiling. 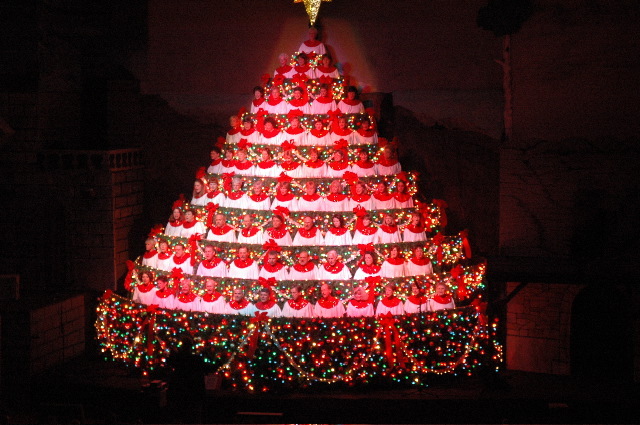 Almost four thousand individual light bulbs, controlled by 38 separate computerized circuits, decorate the Tree itself. If all of these were turned on full brilliance at the same time, the current flowing into the circuits on the tree would be about 165 amps (by actual measurement)! (More data on the Technical page - see below). Meanwhile, the carpentry crew has already erected the drama's 5- or 6-level stage platforms and backdrops, while the electricians string electrical cables and make the many hundreds of connections needed to provide the light shows. Most of the work with the microphones, extra amplifiers and speakers for the sound effects, and many other items cannot be done until Wednesday. But enough of this is ready by Wednesday evening to allow the choir to rehearse in the tree. Work on the electrical systems, PA systems, fog machines, ascension hoist, Tyrolean traverse, and other parts continues through the week. By that Sunday, the tree, stage, set, lighting, and electronics (hopefully) are ready! Some of our special guests from Ft. Knox (2003). Click on picture to enlarge. Click here for more Ft. Knox pictures, 2003 and 2004.
interpreting for the deaf (18K). Some years, thanks to the assistance of the chaplains, things work out properly for us to invite the Army Recruits from Fort Knox to attend a special performance. In addition to the LCT, it has been possible the past couple of years to provide them with a pizza and homemade desert supper before the LCT performance. For some of the young men and women, this is really the only Christmas they will be able to experience that year. Many are very anxious to be able to attend. A few probably come because their CO tells them that they are expected to go, while for others it's simply a chance to get away from the base for a few hours. But, regardless of their reason for coming, by the time the performance is over, they have become the most enthusiastic audience of the year! Their enthusiasm is infectious to the choir and cast, which usually results in our strongest performance. See some snapshots of the troops. Click on photo for a whole PAGE of photos on that subject! 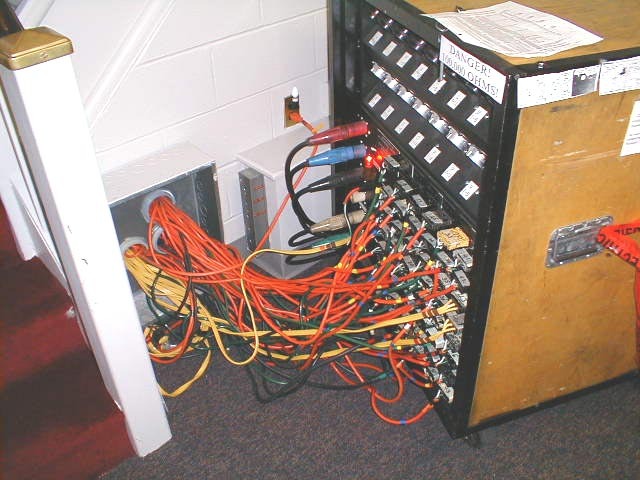 Audio board. Click on photo for a page on the technical aspects of the LCT, with data, photos, and some descriptions. Click on photo for a page of LCT scenes (and some stories). Click on photo for a page of pictures of the Drama. Click on photo for a page of pictures taken during the erection of the framework. Click on photo for a page of shots of the LCT cast (both human and otherwise). Click on photo for a page of pictures of the tree and the choir. Angel over Mary's house. Click on photo for a page of angels. "Joy to the world! The Lord is come...Let every heart prepare Him room!" After the performance, the real work begins! Photographs on these 10 LCT pages by Mike Byers, Dr. Doug Ball, Shelby Ennis, and Lora Ennis. Choir, cast, crew - remember that you can download any of these images to your computer if you wish to save them. First, click on the small picture of interest to bring up the larger version. Next, right click on the picture, bringing up a menu. Choose, "Save Image As..." (Be sure to note the directory/folder where it goes, or change to suit your preference. Also note the cryptic name of the .JPG file). Tell it OK. 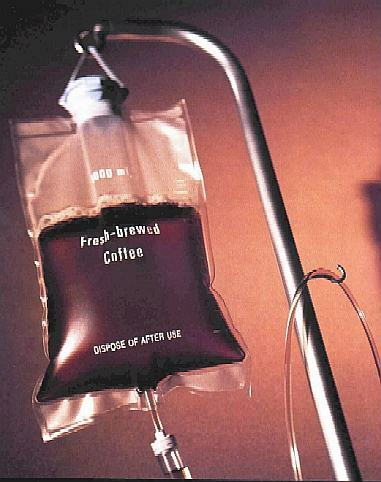 This should save it. Or, you can bring up the larger picture, then go to the "File" options at the top left of your browser and do the same thing. Electricians, decorators - A copy of the general wiring and decorating instructions for the tree proper in Word DOC format can be downloaded here, if needed. Also, a list of the under-tree power connections can be downloaded. These are only for the tree itself, and these documents are updated at the end of each year. These are placed here in case anyone needs this information for adjustments or emergency repairs. Further information concerning the drama lights, overhead lights, etc, must be obtained from Ron Dowell. Merry Christmas, and may you know the True Reason for our celebration of CHRISTmas.